The ruins of Ramazani Riba-Riba’s store at Lokando. 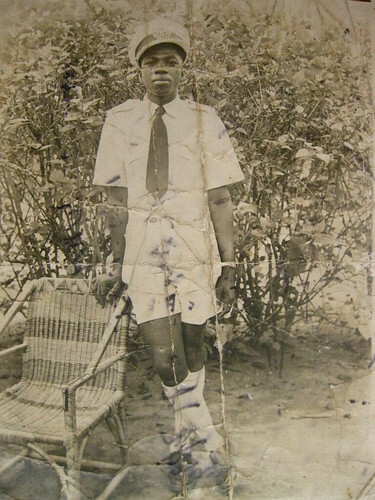 Ramazani was the first of three sons shot dead in front of Chief Riba-Riba during the post-independence rebellion of 1964. 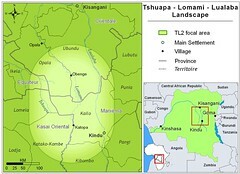 Our cross forest trip to Camp Bonobo started at Lokando, an ancient port on the Lualaba/Congo. Our dugout pulled up at the beach; we unloaded our motorcycles and headed towards the forest. Immediate impression: these ruins are remarkable! Not often do you find ruins in Congo’s tropical forest; not often was there an infrastructure sophisticated enough to resist the tropical decay that sets in as soon as upkeep stops. 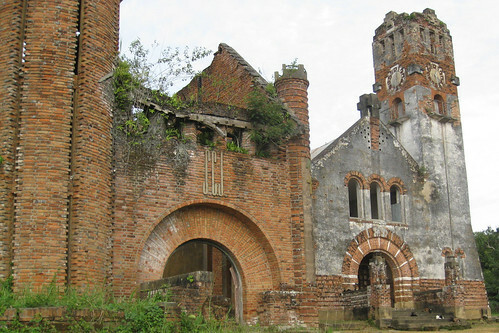 The ruins of Lokando recall the greatest glory of the Belgian colonial era. 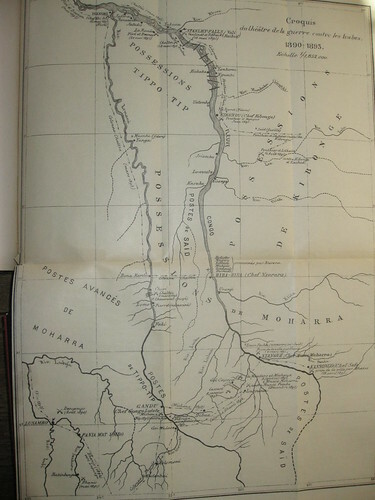 The Belgians won the Belgo-Arab war, here in the center of Congo, in the watersheds of the Lomami and the Lualaba in the last decade of the 19th century. King Leopold II published this map in 1894 right after his troops claimed victory in the Belgo-Arab war. It documents the campaigns, battles, and martyrdom. Riba-Riba on the Congo River is present-day Lokando. 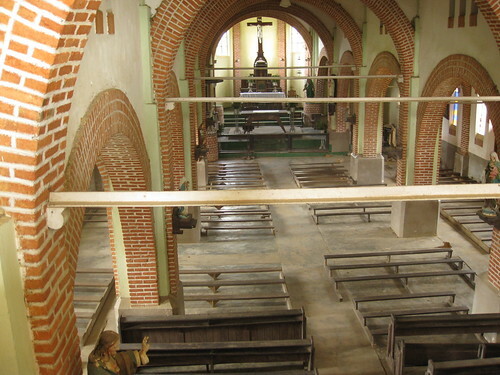 The great church of Lokando, built in 1907, was built to commemorate the site where the murder of Hodister, an ivory merchant, on 15 March 1892 catalyzed the war. 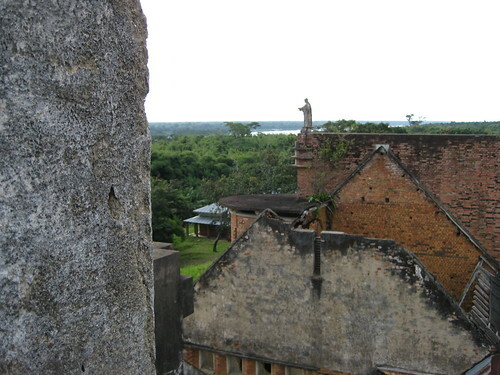 View from the belfry of the ruined church. Even in the clarity of a tropical morning, with goats on the shady sweep of stairs, it was clear these cathedral ruins were not only of high church but of lofty ideas. This church was meant to rise up on the ashes of African-Arab strength and to proclaim the God of the Christians and the dominion of the Belgians. The cathedral never quite did that – Lokando is now only a village and primarily an Arab village. But in the end it was not a Christian-Arab conflict that doomed the church to ruin. It was the rebellion of the 1960s that followed independence. With goats on the steps up to the great carved doors. At Lokando’s church I asked about the Riba-Riba of the Belgo-Arab war (see maps), after all that is the name of Lokando on the old maps, King Leopold II’s early maps. It was one of the Arab sultanates of 19th century Congo. 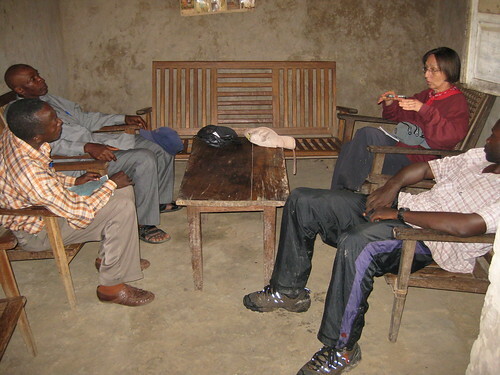 The two Riba-Riba brothers, school master and current chief, tell me the history of their family. 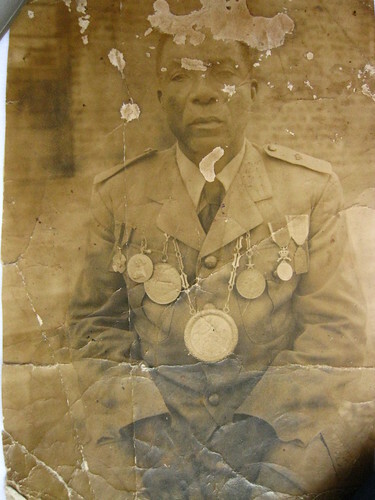 Although Nserera started the Belgo-Arab war here at the post of Riba-Riba with the massacre of Hodister and his caravan, Nserera, himself, was not captured until 1894. His court martial and subsequent death marked the end of the war. 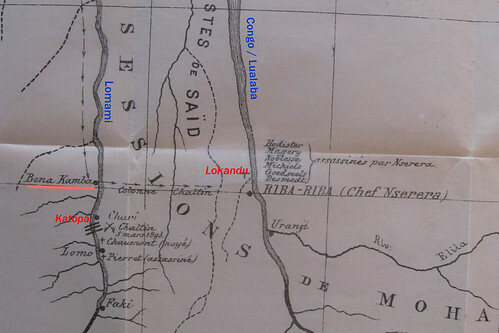 A close-up of the 1894 map above shows the old Arab slave/ivory route across from Bene Kamba on the Lomami River to Riba-Riba (now Lokando). Bene Kamba still exists, now a village of a couple dozen families. Riba-Riba the grandfather who witnessed the murder of his three sons. Adolfe Riba-Riba, the youngest of three sons shot in Lokando by the troops of Paul Mulele. 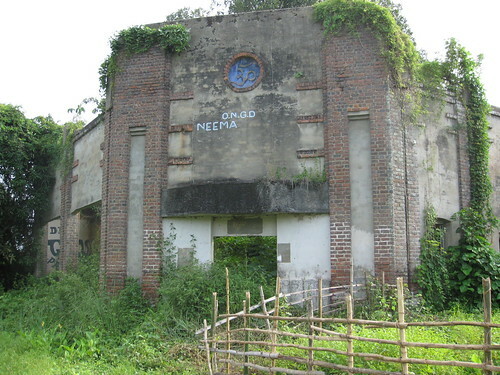 This was the home of the first Chief Riba-Riba and where the children and grand-children were born. Lokando is a town of many ghosts, alive and dead. May they rest in peace; may they live in peace; may Lokando be born again. Within its ruins, the church of Lokando is still alive. This entry was written by Terese Hart, posted on 2009-04-18 at 10:05 pm, filed under History of TL2. Bookmark the permalink. Follow any comments here with the RSS feed for this post. Post a comment or leave a trackback: Trackback URL. It was sad to write. The Riba-Riba’s were so dignified but talked about the past as though it was yesterday. You are doing a great service by documenting the human history of this region as well its natural history. A moving story and wonderful photos. Congo’s history is so fascinating – sad. Whenever I learn a part of it, I am hungry for more. Thank you for recording and sharing these pieces of history mama. 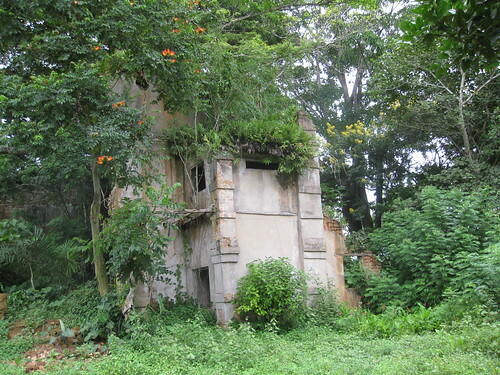 When I saw the ruins of the Riba-Riba family home, I, too, stood there and thought of the hotel by the road in the Ituri with strangler figs growing over the walls. It is in the same stage of ruin — both the post-independence rebellion. turned into a termite mound and a bird,but I do believe it. I love it when I see my family history on a public website!